Today is National Ag Day! National Ag Day was started by Agriculture Council of America (ACA) which is an organization uniquely composed of leaders in the agriculture, food and fiber communities dedicated to increasing the public awareness of agriculture’s vital role in our society. The Agriculture Council of America and the National Ag Day program was started in 1973. It’s a day of recognition – for the farmers, ranchers, families, distributers, businesses, and people that make agriculture in our country so great! It’s a day of support – for all of those involved in the agricultural industry and for all of the laws and policies that affect how their farms and businesses operate. It’s a day of education – to promote the facts about agriculture and the process of how products get from the farm to your fork. And it’s a day of pride – for all those involved in agriculture to share their pride for what they do, and help promote agriculture by sharing their story. 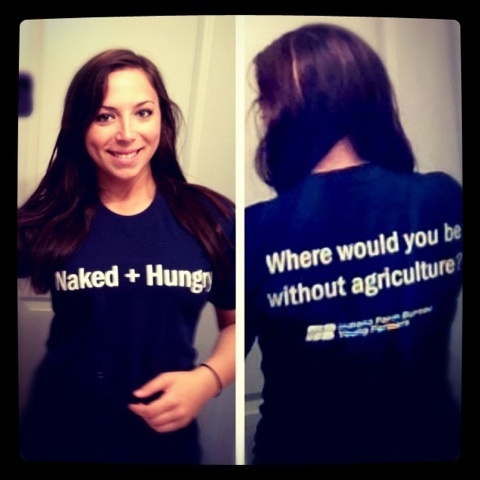 And today – I want to share my #AgProud story! I originally wanted to write this post for a fellow blogger friend Ryan Goodman over at I Am Agriculture Proud a long time ago, but since I never published it, now seemed like the perfect time to share it with everyone! 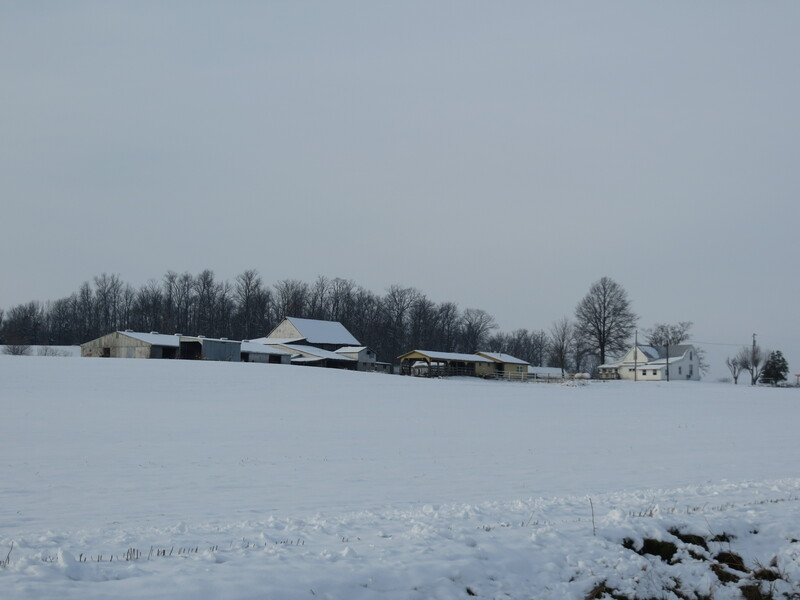 The story of BoilermakerAg starts in a small town in southern Indiana on my grandpa’s dairy farm. This was where it all started. Where my roots are grounded and the homestead where my grandparents raised 12 children, dairy cows, and crops since 1949. My parents didn’t directly farm but my aunt and uncle, along with my grandpa until he retired, ran the farm and babysat me during my very early years. From a very young age, I learned about the meaning of hard work, caring for animals, and the basics of farming. Circa 1991 – Me with my Uncle Albert over at the farm. 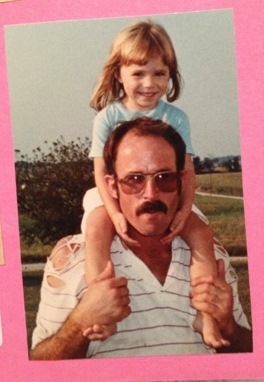 I was always right by his side and loved helping him with the cows! Some of my favorite farm memories are helping deliver calves in the field with my uncle, helping bottle feed and care for calves, helping milk cows, and the smell of the milk house. One specific memory was when I was helping my uncle on the farm and all of a sudden he said we had to jump in the truck and go up to the hill where a cow had started going into labor. The mom was having difficulty and if we didn’t get there fast, we could lose the calf, or the mom. We got there and he ended up having to “pull the calf” which is when the calf isn’t delivering in the right direction and you have to gently pull the calf out to help the mom with the process. Luckily, we got there just in time and both mom and calf were just fine. It was an incredible moment to witness and be a part of, and it was when I realized that I had a passion for animals and agriculture. When the calves were a little older, they were moved into the barn into stalls where we could monitor them and bottle feed them. This was a favorite memory because as a little kid, it was fun to care for them and funny because they were all slobbery and it was like a little game with the calf sometimes to try to pull the bottle away from you. The other best memory I have from that time is helping milk the cows and the smell of the milk house. Any time I ever visit a dairy farm, that smell is always so comforting and takes me back to my childhood days on the farm. 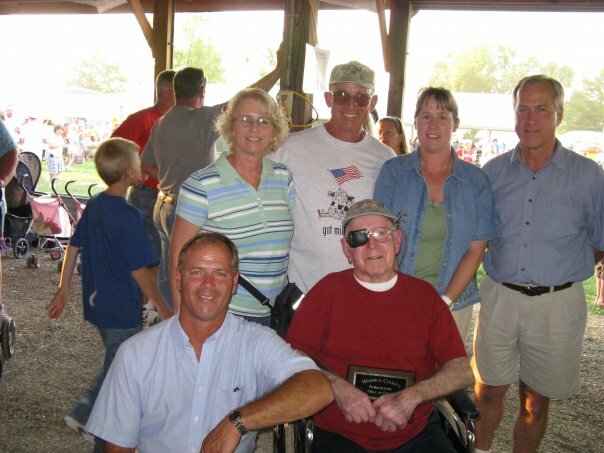 In 2008 Warrick County Fair my Grandpa Nord was inducted into the Warrick County Agriculture Hall of Fame. This was a very proud moment as I got to watch him receive this award during our 4-H livestock show. I had agriculture running through both sides of my family too, but I didn’t learn about that until more recently in my life. My dad sells agricultural insurance and sold seed earlier in his career and my mom’s family was involved in agriculture as well. My mom’s dad and grandpa actually grew seed corn in the 1950s and had a hog farm for a while until they opened a campground and hand-turned pottery store in the late 1960s. My great grandpa Charles started the seed corn business and my grandpa Jim helped him growing up. 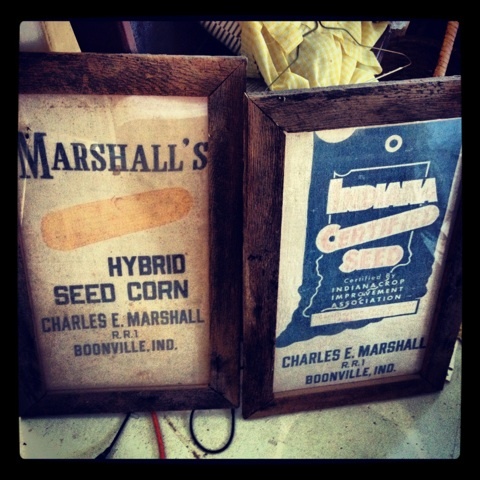 These are some original seed bags from their seed corn company. What a cool piece of Ag history! My grandpa still tells me stories about those times and its always so interesting to hear about that time period and how agriculture has changed since then. From there my ag story continues with me being in 4-H and FFA and showing pigs at the county fair. I learned a lot about other species of livestock and this is where I got exposed to Purdue University – where I would later attend the College of Ag. 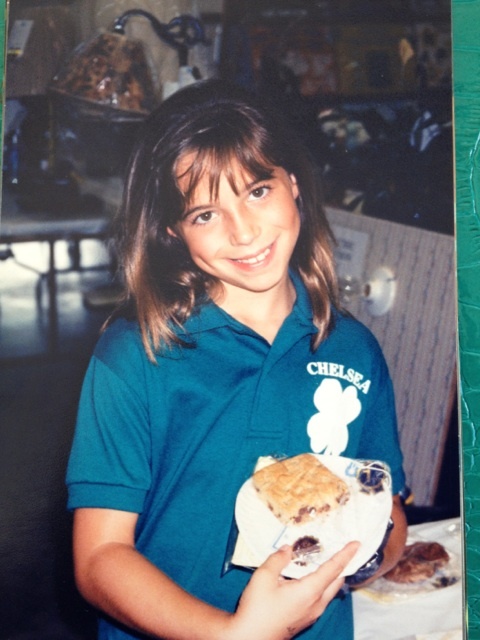 Here’s another throwback picture from me during my first year in 4-H. I ended up being a 10 year member and gained several of the valuable skills and qualities that help me in my career today. Growing up in rural Indiana also gained me exposure to all areas of agriculture through my friends (if their families farmed) or through the extension service or 4-H. But it wasn’t until going to college and starting my career where I learned just how fortunate I was to have grown up around agriculture and how it has helped me become the person I am proud to be today. I ended up majoring in Agricultural Communication with a minor in Animal Science and now work in marketing at a seed corn company in central Indiana. I get to interact with farmers all across the Midwest, hearing their stories and sharing them in our newsletter. I always enjoy these interactions because it can take me anywhere from the farmer’s kitchen table, farm shop, or even driving with them through the fields. I always take these opportunities to really listen to their stories and make mental note of any advice they can give me or facts about agriculture that they have to share. I had to leave my rural setting to live in the city, but my rural roots in agriculture haven’t, and never will, leave me. I am Agriculture Proud because my families have been a part of agriculture for several generations, I have been taught the meaning of hard work, getting your hands dirty, and respecting the land and Mother Nature…because as a farmer, your livelihood depends on it. I am Agriculture Proud to continue the involvement in agriculture within my family by sharing my stories and experiences in the ag industry. I am Agriculture Proud to be associated with some of the nicest, most honest, passionate people on this Earth. My agriculture story could go on for pages, but I hope this gives just a peak into why I am, and always will be AGRICULTURE PROUD! Where would you be without Agriculture? What’s your Ag Proud story?